I have a week off from school so I decided to hop on a plane to Tel Aviv to visit the Englishman. We are trying to keep the space between visits to under two months. Ridiculous by most standards of coupledom, but it’s an improvement for us. I arrived at the airport, and after surprisingly little hassle from the Israeli customs officer, I strolled out into the terminal to see a very happy and familiar face waiting for me. My flight got in early so we had dinner in Jaffa, at a favorite restaurant of ours by the sea. I love that part of town, the thrift market and bohemian shops, the crumbling buildings and the mixing of Arab and Jewish neighborhoods. It is only a short drive to Ramallah, and on the way The Englishman pointed out a brand new mosque that has gone up since my last trip. It looked beautiful in the night sky, so tall and gleaming green against the hillside. Further along the road into Ramallah there is another mosque and below we saw a father and son preparing a hanging goat for the holiday. 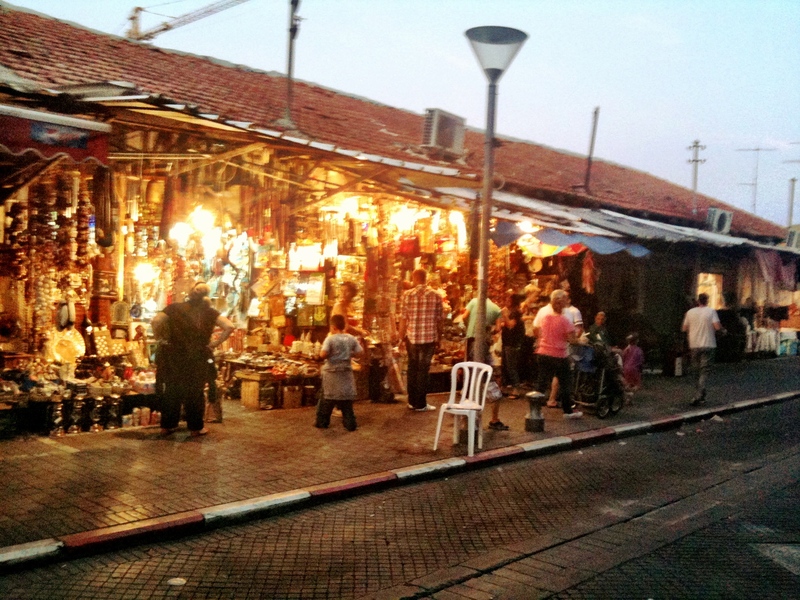 It’s the end of Eid and this weekend Ramallah felt festive and alive. Everyone was out in the streets, the restaurants were full and the kids giddy playing with their new toys. It is a bit unsettling that all of the toys seem to be very realistic looking semi-automatic weapons – but they seem to be having fun all the same. Despite the still warm weather, the fruit trees in the garden are bare, but the Englishman’s house is much how I left it; the bright checked table cloth is on the little table in the kitchen, the metal tin on the counter is full of tea and we have picked up our game of cards more or less where we left off last month. I am still getting used to the sounds here. In Nice, I sometimes have trouble sleeping because of the clanging of the comically loud garbage truck and the curiously ineffective street cleaners that seem to be in no rush to finish their work, spraying and and scrubbing late into the night. In Ramallah I was woken up the first night by a group of yipping puppies that must have found a pool of early morning sunlight outside the bedroom window to warm themselves. Each night since, I have been gently woken by the 4 am call to prayer. I find it beautiful, almost seductive. In that hazy place between sleep and wakefulness, I can almost see the low hum of the song like tendrils reaching out and luring people towards it, like bleary eyed people might be lifted from their beds and carried by the vibration out of their houses to pray. We spent a day at the beach in Jaffa, marveling at the heat. It feels summery In Tel Aviv, complete with warm evenings perfect for dining outside and an ocean warm enough to swim in. 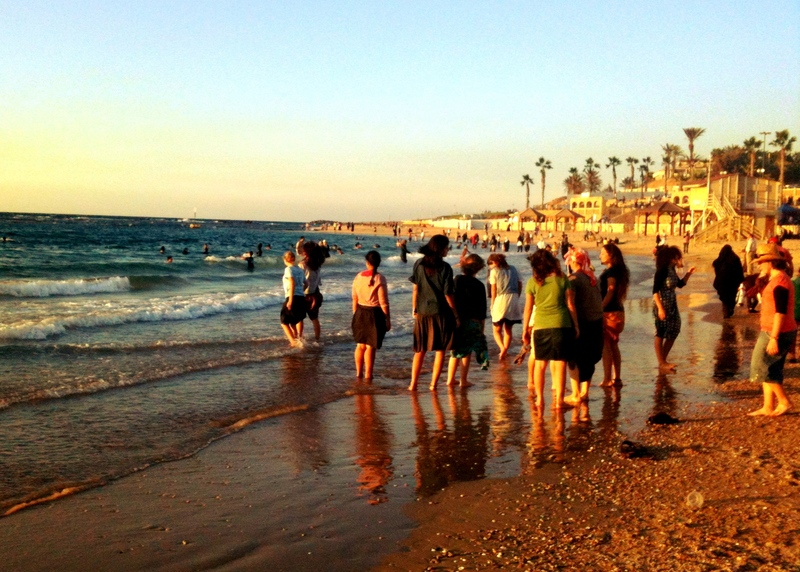 The beach in Jaffa was crowded with family barbeques and celebrations. It looks so odd to me to see women fully dressed some with head coverings lounging and swimming in the sea. It seems so cumbersome to be weighed down with all of those soaking clothes. I wonder if they ever get used to the feeling. 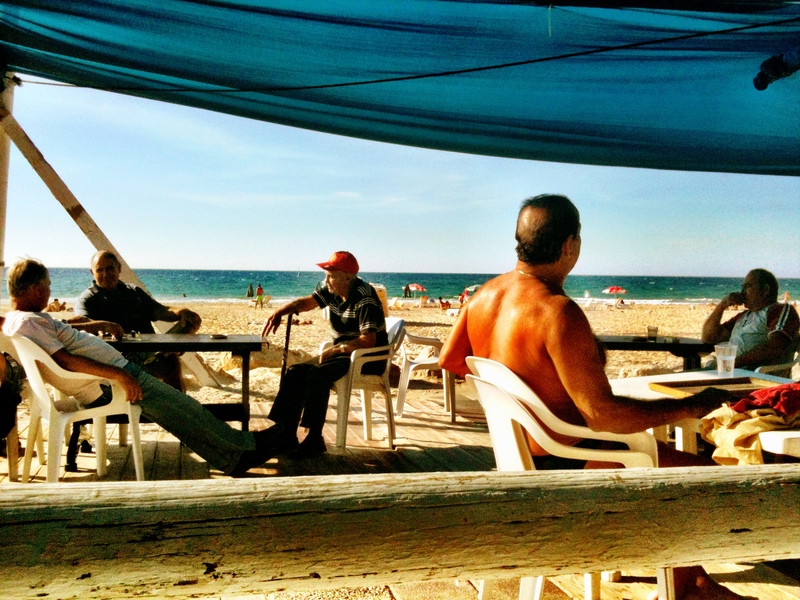 We walked down the beach and had lunch in a beach bar filled with old men – who all seemed to be named Mordechai – playing cards and yelling at each other. The average age must have been 70 and I doubt they get many women visiting the establishment, but the spicy hummus and French fries washed down with ice-cold beers were perfect. Time seems to be moving too quickly, but it always does when there is a goodbye on the horizon. It feels normal to be in the same place again. And I think I am starting to be able to imagine keeping it this way for longer than a few weeks at a time.